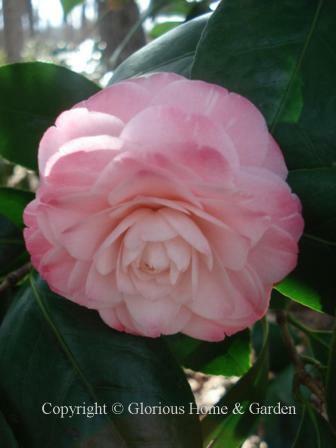 The Camellia japonica, or Japanese camellia, is one of the loveliest shrubs in the winter-to-spring garden in the milder areas of the country. 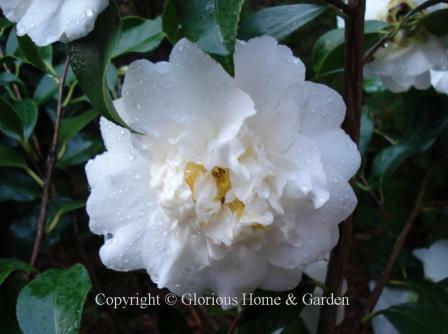 Blooms of white, blush pink, deep pink, red and variegated cultivars--even a few yellows--in forms that resemble roses or peonies, have gardeners wanting "just one more" to add to their collections. 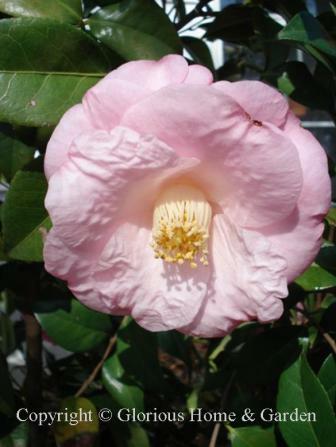 Picking up where Camellia sasanqua leaves off, and depending on choice of cultivar, you can have blooms from late fall to mid-spring. 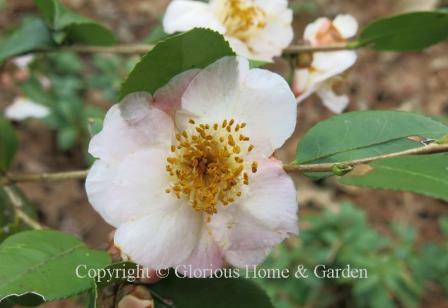 Though hardy in Zones 7-9, cold winter winds and freezing temperatures, even in the Atlanta area, for instance, can freeze buds and turn flowers brown. If you want to give one a try north of Zone 7, pick a late blooming variety, plant it in a sheltered location and mulch well. 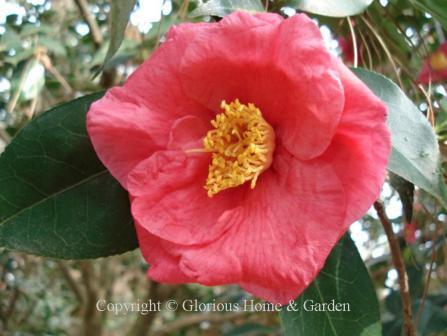 Many Northern gardeners, avid to grow camellias, depend on greenhouses to nurture these plants. 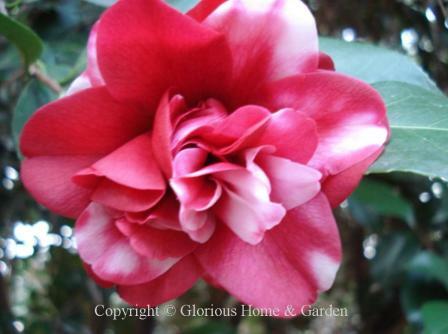 These evergreen shrubs have gorgeous flowers and look like they should be as fragrant as a rose, but most lack scent; however hybridizers have been working to develop fragrant camellias. There are lovely ones out there that are worth seeking. 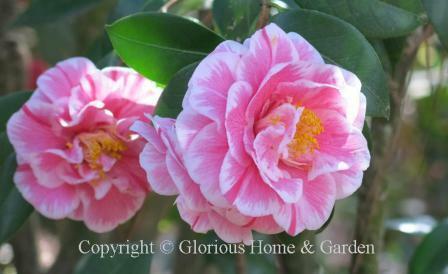 Fragrant Pink--deep pink ruffled small blooms, peony form. Hybrid. 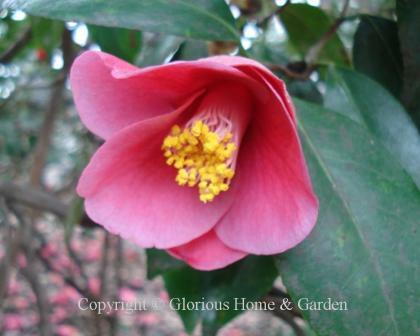 Herme--deep pink with lighter border, semi-double. Also known as 'Hikarugenji' which means "Brilliant Gem." 'Alba Plena.' 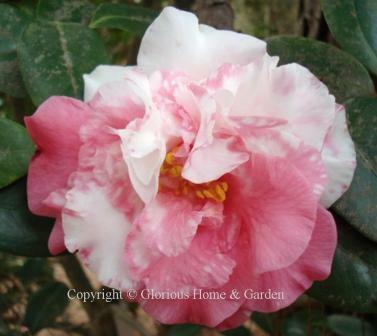 This is an old variety originating in China in 1792. 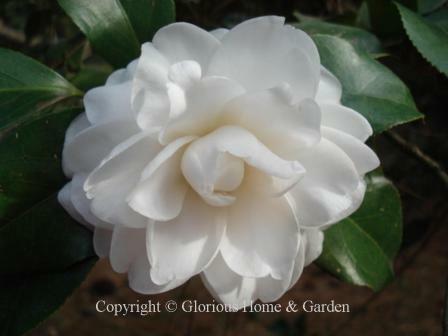 Pure white, double formal shape. Picture taken at Massee Lane Gardens in Ft. Valley, GA.
'Barbara Morgan.' 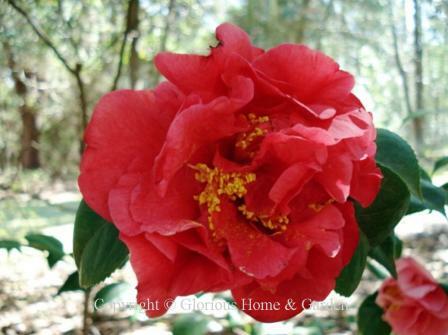 Bright red with large, ruffled petals. 'Carter's Sunburst.' Pale pink with darker pink striping. Semi-double to peony form. 'Dr. Tinsley.' Pale pink shading to deeper pink at edges. 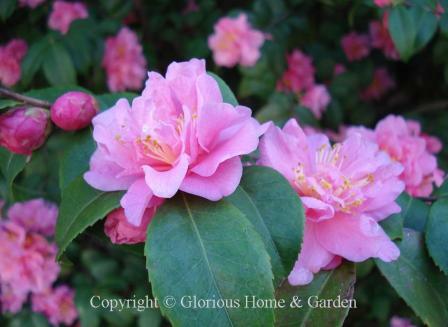 Semi-double with puckered petals and formal brush-like cluster of stamens. 'Governor Mouton.' 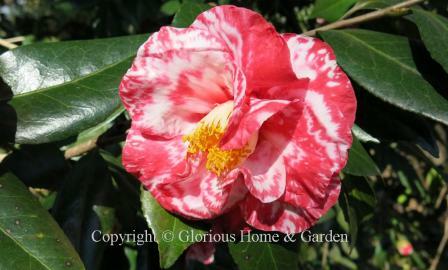 Variegated red, white and pink. 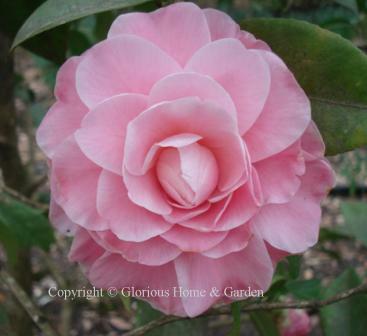 Semi-double or peony shape. 'Grace Albritton.' 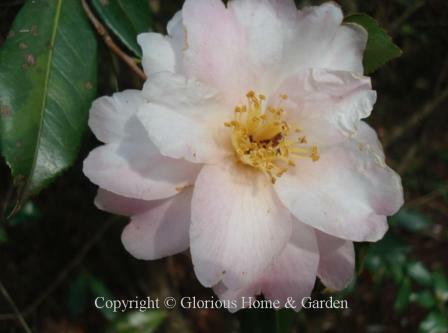 Small pale pink blooms suffused with deeper pink at edges. Formal double shape. 'Guilio Nuccio Variegated.' Variegated red and white. Semi-double. Reminds me of flame-stitch fabric. 'Jan's Chance.' 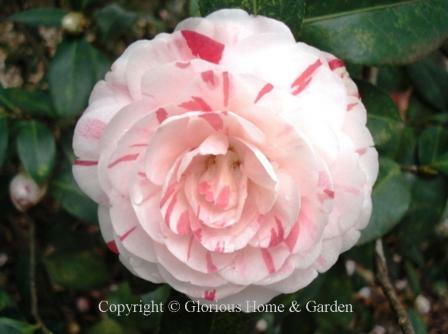 Variegated rose and white. 'Lady Clare.' Deep pink semi-double. 'La Peppermint.' White with pale pink to deep pink striping. Rose form. 'Magnoliaeflora.' Blush pink. Formal semi-double shape. 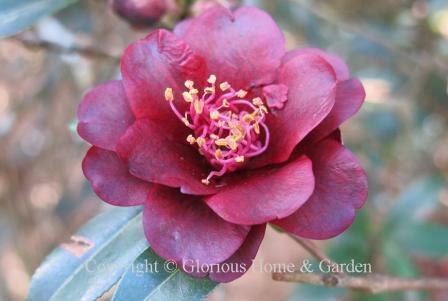 'Night Rider,' This very dark red, near black hybrid is an eye-catcher. 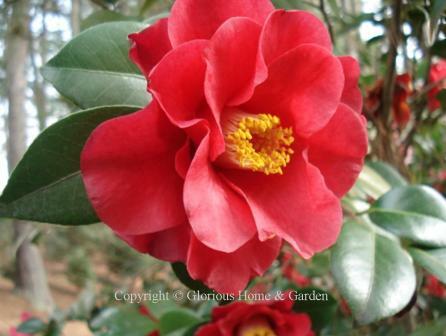 The small semi-double blooms sport thick, waxy petals and reddish stamens. 'Shiro Chan.' A pure white anemone type with a fluffy tuft of smaller petals in the center around the yellow stamens. Sometimes shows a bit of pink at the base. 'Unryu.' 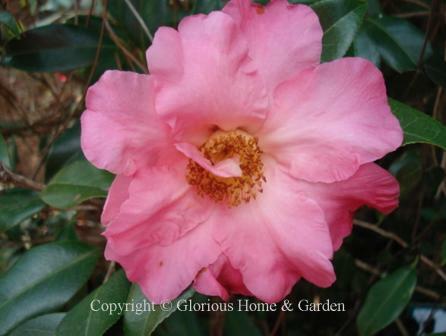 An interesting variety with small single blooms of reddish-pink with hints of mauve. The name means "dragon in the clouds" referring to the twisted shapes of the stems. 'W. C. Wyatt.' Pink. 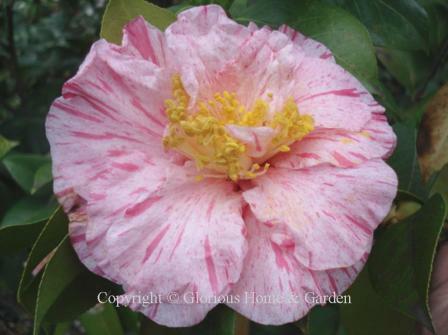 Large semi-double form, ruffled petals. C. vernalis 'Star-Above-Star.' White flushed with pale pink. Semi-double layered look. 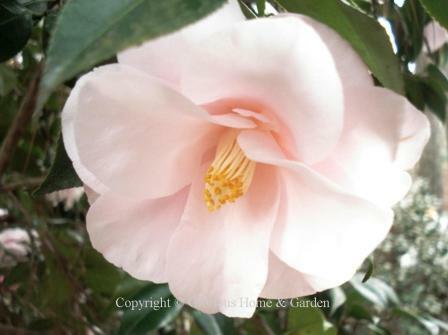 For more information about Camellia japonica, contact the American Camellia Society at Massee Lane Gardens, Ft. Valley, GA.